Notes: This item is die cut to fit the trunk, and is flat (not molded). 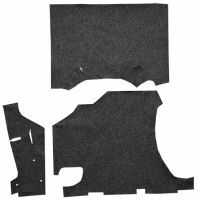 Stock Interiors is proud to offer the highest quality Pontiac Bonneville custom fit trunk mats. Our trunk mat kits are made from the original materials in the correct patterns, styles and colors. They are available in fleece, felt, foam, bertex and vinyl and have carefully duplicated many of the popular trunk mat patterns to meet or exceed OE recommendations. Our trunk mats provide a perfect installation fit with no trimming required and do not have binding on the edges.